My Daily Art Display today looks at the life and works of one of England’s most controversial artists. He was not just an artist, illustrator and printer, he was also a renowned poet. The controversial nature of this person derives from what he drew and wrote about and his beliefs. My featured artist today is William Blake, the writer of prophetic works which are termed works of mythopoeia. Mythopoeia is the act of making or creating mythologies. In the case of Blake, they are stories of artificial mythology, which he himself created, such as Vala and The Four Zoahs where he would introduce us to characters with the strangest names, such as Enitharmon, Albion and Urizen. I suppose to draw a present day parallel to his type of work we should think of Tolkien’s Middle Earth sagas or C S Lewis’s tales of Narnia. What is probably a little bit more bizarre and daunting about William Blake was that from a very early age he believed in visions and told people about his regular sightings of angels and other heavenly bodies which he was able to communicate with. I have put together a short biography of the man and split over this and my next blog. There have been numerous books written about him and when you read them you will see that he trod a very fine line between sanity and insanity. He was never vigorously condemned during his lifetime by the Church or by his contemporaries. The reason being it was probably due to him being looked upon as a harmless eccentric who had few followers and therefore his beliefs would never gain hold and therefore never pose a threat. Catherine Wright Armitage married her first husband, Thomas Armitage, a hosier, in 1746. Catherine and her husband had one son, also named Thomas, but he died in 1751, when he was just five years of age. Ten months after the death of her son, Catherine’s husband died. The following year, 1752, Catherine married James Blake. They were to have seven children, the third of whom, William, was born in 1757. William Blake was to grow up to become one of the great English poets and painters and an influential figure in the history of both the poetry and visual arts of the Romantic Age. William Blake did not receive any formal education but he received home tuition from his mother. In 1867 at the age of ten he attended William Shipley’s Academy in the Strand where he received drawing lessons from Henry Pars. Historians would have us believe that both his mother and father were Dissenters, members of a religious body who have, for one reason or another, separated from the Established Church. They were members of the Moravian Church and later fervent followers of the teachings of Emanuel Swedenborg. Blake had a strong religious upbringing. Even at the early age of four Blake would tell his parents about the visions of God and angels he had experienced. His strict religious background would influence Blake for the rest of his life and was to be an inspirational stimulant for his artwork in the future. Just before his fifteenth birthday William Blake was indentured for seven years as an apprentice to James Basire, engraver to the Royal Society of Antiquaries. He spent a lot of his time during his apprenticeship copying images from the Gothic churches in London as well as Westminster Abbey and this time in his life was to prove inspirational to the young artist and would shape his future artistic style. Again, as was the case when he was a young child, he would talk about religious visions he had whilst working amongst the religious icons. In 1779 on completion of his apprenticeship he became a professional engraver and he enrolled at the Royal Academy Schools at Somerset House as an engraver. He exhibited his first work, a watercolour entitled The Earl of Goodwin, at the Academy the following year. Although he exhibited further works during the 80’s and 90’s, he turned against the establishment denouncing it as a fraud. In 1780 hegoes to work for the radical publisher Joseph Johnson carrying out commercial engravings. He was to have a long association with Johnson and through him would meet the likes of the Swiss artist, Henry Fuseli, the writer and feminist Mary Wollstonecraft and the American revolutionary Thomas Paine. It was during that time that Blake became involved in the Gordon Riots, an anti-Catholic protest which lead to wide spread rioting and looting in London. That year he was also arrested as a French spy when he and some fellow artists were on a sketching trip by boat on the River Medway. It took the pleas from members of the Royal Academy to get them all released. In 1782, aged 25, William Blake married Catherine Boucher, who was the daughter of a market gardener. She was five years his junior and illiterate. We know this as their wedding certificate still exists and she signed her name with an “X”. They set up home in Leicester Fields in London close to where sir Joshua Reynolds, the President of the Royal Academy lived and William taught her to read and write as well as the art of engraving. In this same year, Blake’s father dies and leaves his son a small inheritance which enables him to go into partnership with a fellow Basire apprentice, James Parker, and together they set up a print shop. However the collaboration does not last long and the partnership breaks up after a year. Blake’s younger brother Robert comes to live with William and helps him in the print shop. Two years later in 1784, Robert falls ill and despite the loving and constant attention given to him by his older brother, he dies. 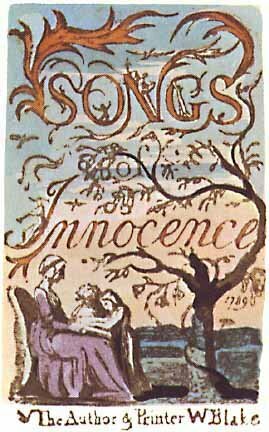 In 1789 Blake set about producing an illuminated book of his poems entitled Songs of Innocence. The poems and artwork were reproduced by copperplate engraving and coloured with washes by hand. Five years later in 1794 he bound these poems with a set of twenty-six new poems in a volume entitled Songs of Innocence and of Experience Showing the Two Contrary States of the Human Soul. I will leave off the biography of William Blake at this point in his life just before he moves away from London and will conclude his life story in my next blog. 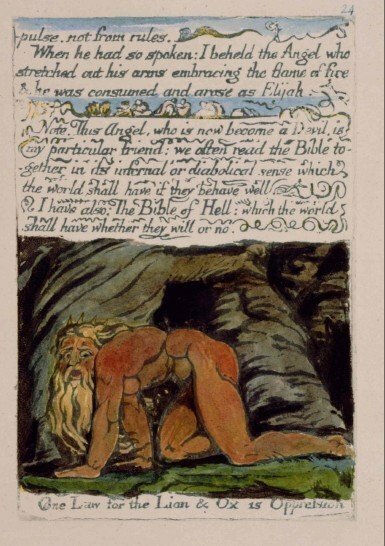 For My Daly Art Display today I am featuring the colour monotype print by William Blake entitled Nebuchadnezzar. This comes from Blake’s Large Colour Prints collection. This collection of Blake’s twelve large colour prints, which he first designed and completed in 1795, are now considered to be his greatest works as a pictorial artist. Their inspirational imagery and the printmaking technique Blake used to create them evolved out of his illuminated books of 1790-95. It is thought that Blake drew an outline of the design on the printing matrix, painted on it areas of gum- or glue-based pigments, and then printed individual impressions on damp paper in his rolling press. It is thought that then Blake and his wife Catherine added ink and watercolour to the impressions. There were no more than three impressions of any one of the twelve designs in existence. The one we see before us today was reprinted around 1805 and there was added more hand outlining and tinting to the original impression. In all there were four copies of this work. One can be found in the Tate Britain, one in the Museum of Fine Arts, Boston and one in the Minneapolis Institute of Arts. The fourth copy is missing. 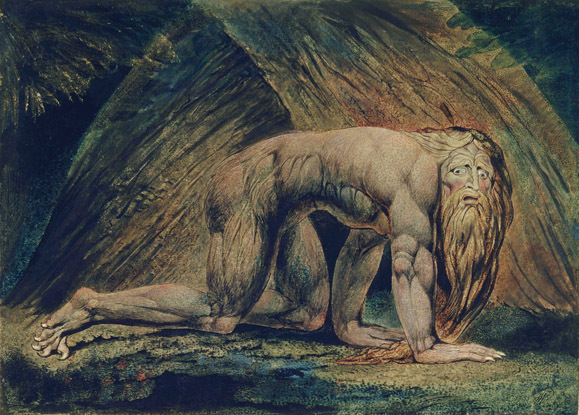 The original depiction of Nebuchadnezzar by Blake dates back to plate number 24 of his book The Marriage of Heaven and Hell which he created between 1790 and 1793 and which was a series of texts and illustrations which expressed Blake’s own intensely personal romantic and revolutionary beliefs. The book was published as printed sheets from etched plates and contained a mixture of prose, poetry, and illustrations. Welcome to the strange world of William Blake. After looking at the younger of the two brothers, Isack, yesterday I am switching my attention to the elder and more famous brother Adriaen van Ostade. Adriaen was born in Haarlem in 1610, eleven years before the birth of his brother Isack. He started off his artistic training at the age of seventeen under the watchful eye of Frans Hals, the Dutch Golden Age painter and great portraitist. Adriaen Brouwer, the Flemish genre painter was a fellow student of van Ostade. His father Jan Hendricks Ostade, a weaver by trade, came from Ostade near Eindhoven and although his sons were born in Haarlem they took Ostade as their family name. At the age of twenty-two he registered as an artist in Utrecht. At this time Adriaen concentrated on genre painting incorporating village scenes which were very popular with people at that time. His scenes often depicted animated scenes of peasants partying and fighting in crowded inns and disorderly living rooms. It is interesting to note that his later paintings depict a more civilised community with people displaying much better behaviour and the interiors of the depicted dwellings began to look more orderly and appealing. He also started to add more outdoor scenes to his works and in general the atmosphere was lighter and more cheerful. He returned to Haarlem in 1634 and enrolled in the painter’s guild of the town, the Haarlem Guild of St Luke in which he was later to become its president in 1666 and 1667. In 1637 he joined the Haarlem Schutterij, a voluntary city guard, sometimes termed a citizen militia, the role of which was to protect the town or city from attack and act in case of revolt or fire. It is interesting to note that these militiamen were generally drawn from the wealthier families and this could mean that van Ostade was doing well with the sale of his art. Adriaen was aged sixty-two in 1672 which was known as the rampjaar, the “disaster year” when his country was plunged into war and was invaded. He decided to leave Haarlem and so he packed up his belongings and headed for Lübeck. However on reaching Amsterdam he met an art collector, Konstantyn Sennepart who convinced van Ostade to stay and who offered him lodgings in his house. We know that van Ostade was highly productive and it is believed that he completed over 800 paintings together with a further two hundred drawings and watercolours. Besides his own art, he taught young several aspiring artists at his workshop in Haarlem, such as his younger brother Isaack van Ostade, Cornelis Bega and it is believed that he also trained Jan Steen. Unlike many artists whose popularity only came after their death, Adriaen van Ostade attained considerable popularity during his lifetime and his style and work were often copied by other artists. Over the next two blogs I am going to take a look at two Flemish artists who besides being highly talented were brothers. They were the van Ostade brothers. Today I am going to feature Isack, who was the lesser known of the two, maybe because he only lived to the age of twenty-eight. Isack van Ostade was born in Haarlem in 1621. He was a Dutch landscape and genre painter. 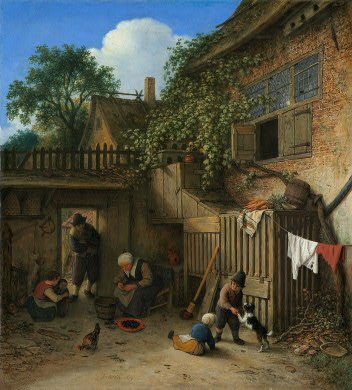 Genre paintings were ones depicting scenes of daily life and were particularly popular in 17th century Holland. Isack and his brother Adriaen, who was eleven years older, were the sons of Jan Hendricx Ostade, a weaver from the town of Ostade, close to the city of Eindhoven. Despite being born in Haarlem both he and his brother took the name “van Ostade” as their family name. Isack studied painting under the guidance of his elder brother until he was almost twenty-one years of age at which time he independently set up his artistic business. He started off painting subjects similar to his brother and his work was always viewed as not as accomplished as the works of Adriaen van Ostade. Realising this, Isack decided to stop painting the genre scenes and concentrate more on landscape work in the fashion of Salomon van Ruysdael, the Dutch Golden Age landscape artist. In his earlier paintings the figures were the key feature but in his later works his landscape becomes increasingly significant. His change to landscape painting paid off and this coupled with his skill at figure painting ensured the popularity of his winter scenes in which we would see groups of animated people in wintery landscape settings. These winter scenes like my featured painting today, Winter Scene, were his speciality. He painted this picture around 1645 and it now hangs in the National Gallery in London. 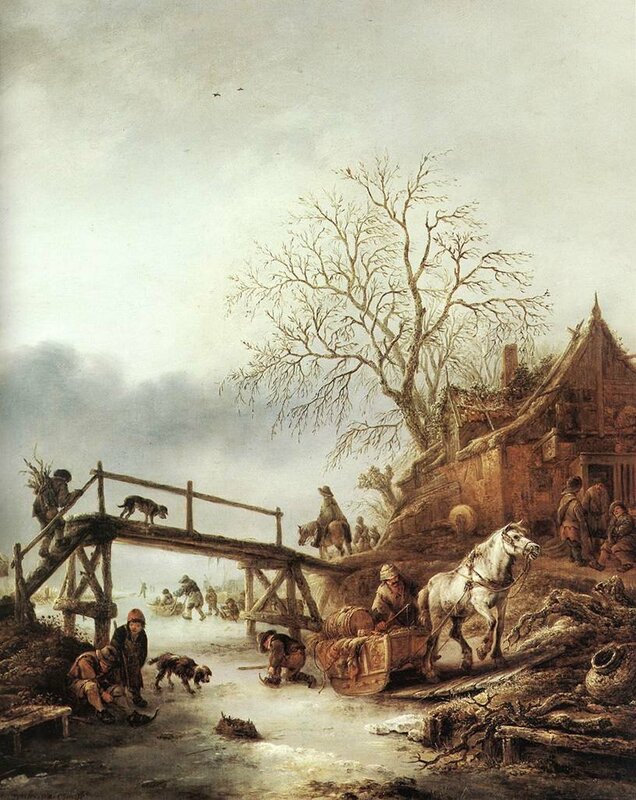 It is quite similar to the painting, Winter Landscape with Wooden Bridge which another Dutch painter, Philips Wouwerman completed fifteen years later. The painting we see before us is beautifully picturesque and we view the scene from low down which allows us to see the old rickety wooden bridge outlined against a silvery grey winter sky with its dark snow bearing cloud approaching the area. The scene is populated by peasants. Some, like the youngsters, are enjoying themselves sledging and skating on the frozen river whilst others, the adults, are hard at work as we see the man encouraging his old white horse to drag the laden cart up the riverbank and we watch old man as he slowly climbs the steps of the bridge, his back straining under his load of firewood. Sadly fewer than three dozen winter landscapes of Isack van Ostade are known today. He died in 1649 at the early age of twenty-eight. He had few, if any, pupils yet his influence on the succeeding generation of Haarlem painters was great and the likes of Philips Wouwerman owed a lot to this young man. Britain is very fortunate to have so many art galleries. Although if one lives in London I suppose one has the cream of the crop but dotted throughout the land there are some excellent art establishments. One of the richest collection of art works is owned by the monarch and is held in trust for her successors and the nation. There are more than 7000 paintings within the Royal Collection as well as thousands of watercolours, prints and drawings. The collection is not held in just one place, Buckingham Palace, but is spread around the royal residences, such as Windsor Castle, Palace of Holyroodhouse in Edinburgh, Balmoral Castle, Hampton Court and Sandringham House. The total collection is estimated to be worth around ten billion pounds. My Daily Art Display today features a painting from the Royal Collection which hangs in Buckingham Palace. It is entitled Queen Charlotte and her Two Eldest Sons by the Scottish portrait painter Allan Ramsay, which he completed around 1764. Allan Ramsay was born in Edinburgh in 1713. He was the eldest son of Allan Ramsay who was a poet and writer. After completing his schooling in Scotland he moved to London when he was twenty years of age and studied art under the tutelage of Hans Hysing, the Swedish portrait painter and later was a student at the St Martin’s Lane Academy, which was the precursor to the present day Royal Academy. In 1736, aged twenty-three he travelled to Rome and Naples to further his art education and he remained for almost three years. On returning to Britain he went to Scotland and settled down in Edinburgh. In 1739 he married his first wife, Anne Bayne, and the couple had three children but none survived childhood and his wife died during the birth of their third child in 1743. Allan Ramsay supplemented his income from his paintings by teaching art and one of his pupils was Margaret Lindsay the eldest daughter of the nobleman Sir Alexander Lindsay of Evelick. As a humble artist her parents frowned on their liaison outside of art tuition and knowing that, the couple eloped and were married in secret. Her parents never forgave her for marrying lower than her station. Allan Ramsey, in an attempt to ease their minds about how he would care for their daughter and that he had married their daughter for love and not for their money, wrote to them explaining that although he had to support his daughter from his first marriage along with his two sisters, he was well placed financially to look after their daughter. Her parents were unmoved by his words. The couple lived a happy life and went on to have two daughters and a son. The devoted couple spent three years in Italy from 1754 to 1757, where they both spent time painting and copying old Masters and whilst there they would earn an income by painting portraits of the wealthy aristocratic travelers who were doing the Grand Tour of Europe. They returned to Britain and went to live in London and in 1761, Allan Ramsey was appointed Principal Painter in Ordinary to George III. The title of Principal Painter in Ordinary to the King or Queen of England was awarded to a number of artists, nearly all of whom were portraitists. It was in this role that he completed many paintings of the royal couple and their children. . So before us we have Queen Charlotte and two of her children but who was Charlotte and where did she come from? Sophia Charlotte was born in 1744 and was the youngest daughter of Duke Charles Louis Frederick of Mecklenburg-Strelitz and his wife Princess Elizabeth Albertine of Saxe-Hildburghausen. When King George III came to the throne it was decided that he should seek to marry someone of royal descent who would be use to life at court but would also have to be somebody who would be popular with the people of Britain. Many of the ladies that George would have liked to have married were deemed, much to the monarch’s annoyance, unsuitable and inappropriate and he had to reluctantly agree to “look elsewhere” ! Eventually a royal match was made, when David Graeme, a British soldier, diplomat and courtier, who had visited many of the royal courts of Europe, reported back to the British that he had found an ideal marriage partner for George. She was Princess Sophia Charlotte. 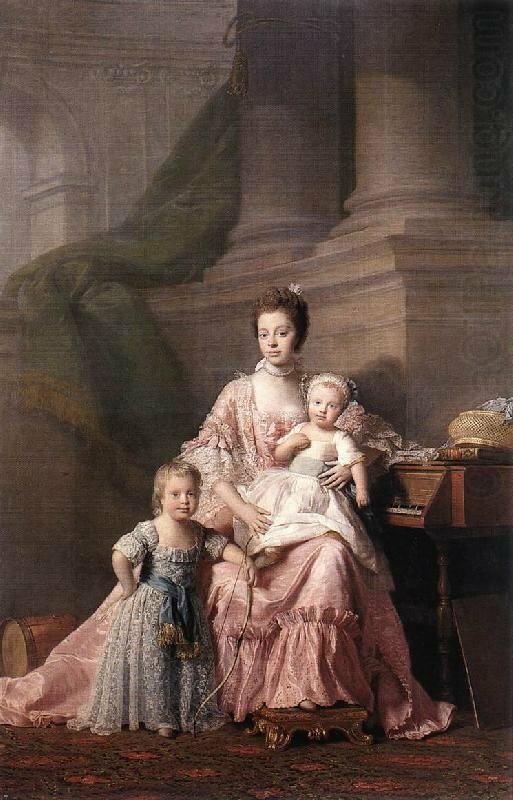 My Daily Art Display today features one of Ramsay’s paintings of Queen Charlotte and her two eldest sons, George, who was Prince of Wales and was later to become George IV and Frederick, Duke of York. As we have seen in other paintings despite the two children being male they were dressed in, what today, we would term girl’s clothing. The elder son, George, stands with his bow in his hand and in the left side of the picture, we can see his drum. These accoutrements have been added by the artist to symbolise George’s future soldierly spirit. His mother Charlotte has her foot on a foot-stool and leans against a piano. On the piano we have a sewing box and a copy of John Locke’s book Some Thoughts concerning Education. At the time, this book, a treatise on education, was considered the most important philosophical work on education in England and it was translated into almost all of the major written European languages during the eighteenth century. The setting of this painting and the items depicted in it all add up to a compassionate relationship between a mother and her children and illustrate how she spent time with them whilst they were at play and how important family life was to them. It is a lovely portrait of a mother and her children. It is full of compassion and the smiles on their faces have put across the impression of happiness and fulfillment. As promised a while back, today I am going feature another painting by the Dutch artist Samuel van Hoogstraten and at the same time have a look at his life story. At the age of three, Samuel and his family moved to The Hague and his father Dirck enrolled in the local painters’ guild. In 1640, Samuel’s maternal grandfather died and left his mother a sizeable inheritance as well as his house and business. The family sold their house in The Hague, at a considerable profit, and returned to Dordrecht where they moved into the grandfather’s much larger house. This was probably not before time as by then the family group had grown and now consisted of Samuel’s parents and seven children. The family continued with the family’s silversmiths business. Sadly, within a year of the move, Samuel’s father also died, leaving his mother to bring up the family single-handedly and at the same time persevere with the family business. Samuel achieved his wish to study to become a painter, for shortly after his father’s death, he moved to Amsterdam and entered the school of Rembrandt. When he had completed his apprenticeship at Rembrandt’s studio, Samuel van Hoogstraten became an official Master and Painter. It is only in some of his earlier works that the influence of his teacher can be seen. In his later years during the 1660’s and early 1670’s he concentrated on genre paintings of domestic households as is the case with today’s featured work of art. He was a man of many talents. As well as being an accomplished artist, he was an expert in etchings and engravings, a gifted poet and writer and in 1656 when he was almost thirty years of age he married, went to live in Dordt, a suburb of Dordrecht, and became director of the local mint. Samuel van Hoogstraten died in Dordrecht in 1678 aged 51. 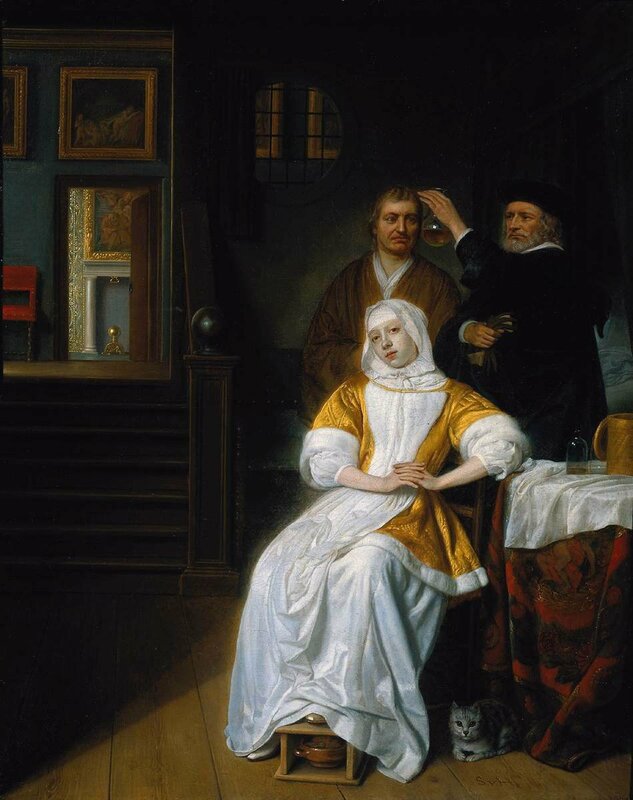 My Daily Art Display featured painting today is entitled The Anaemic Lady which Samuel van Hoogstraten completed around 1667 and can now be seen at the Rijksmuseum in Amsterdam. The setting is a room in a house. It appears to be a wealthy household judging by the sumptuous furnishings, gilt leather wall hangings and the paintings on the wall. Before us is a pale faced woman, head slightly tilted to one side, reclining passively, if somewhat lethargically in her chair, with her hands clasped before her. It is a mysterious scene and we immediately wonder what is happening in the painting. Although the woman has a sickly pallor we are not sure what ails her but there are clues. Behind her we see two men. One is a doctor holding up a flask of the woman’s urine to the light in order to determine whether she is in fact pregnant. The other man, perhaps her husband, perhaps her lover, looks on with great apprehension at the bottle and maybe he fears the result of the examination. So what is the story behind this scene? There are a couple of helpful hints in the painting. Look at the naked figures, part of the design of the tablecloth and then look at the painting above the door which depicts an image of Venus, the goddess of love. More importantly, look on the floor by the woman’s feet. We see a cat. Why would the artist add a cat to the painting? Was it just a sign of domesticity and the family pet? We should however remember that the cat was a medieval symbol of lust and in this painting its presence may represent illicit love. This is not simply a cat stretched out on the floor but one which has trapped a mouse between its paws and maybe we should interpret that as reflecting the fact that maybe the man and the woman have, like the mouse, been caught and trapped by one moment of passion? Does that sound a little farfetched? Well here is a further twist to the story of the painting. What you are looking at now is the painting after its restoration in 1989. During the restoration work an overpainting was discovered. Prior to the restoration work there was neither the mouse between the cat’s paws nor a second man in the painting. The work just depicted a doctor treating a woman who was ill and the family pet lay lovingly at her feet. There was now no hint of pregnancy, or entrapment. It was thought that some time during the 19th century both the mouse and the man were painted out. The reason for this overpainting is believed to be because it was not considered genteel or proper to refer to an unwelcome pregnancy or hint at its consequences. I will let you decide whether this is simply a scene of domesticity and whether the cat and mouse is just a load of nonsense, but if so, why overpaint the mouse and the second man? Today I am starting My Daily Art Display blog by introducing you to some new “isms” which have a connection with what is to follow. They are Post-Impressionism, Neo-Impressionism, Pointillism and Divisionism and they all are connected in some way to today’s featured artist George Seurat. By now you will have read many of my blogs that cover the works of the Impressionists such as Monet, Renoir, Degas and Caillebotte and so by now you are familiar with the term Impressionism. Post Impressionism was a style of painting that grew out of Impressionism or maybe we could say it was a style of painting which was a reaction against Impressionism. The three main artists who were central to this new group of painters and who were termed Post Impressionists were Gaugin, Van Gogh and Cézanne. Gaugin retained the intense light and colour of the Impressionists but discarded the idea of painting from nature. He was totally against naturalism, where artists depict nature just as it is, and in its place he wanted his works to have more inventive subject matter and he also liked to experiment with colour. On the other hand Van Gogh continued to paint from nature but developed a highly personal use of colour and brushwork which openly expressed his own expressive response to a subject. Cézanne kept faith with the Impressionist’s principle of painting from nature but his works came across with a greater energy and vitality. Today I am going to look at Neo-Impressionism and Neo-Impressionist artists who were a distinct group of painters within the Impressionist movement and in some ways formed a transition period between the Impressionists and the Post Impressionists. The two leading figures of this trend were Georges Seurat and Paul Signac and they wanted to have a more scientific approach on how light was depicted in their paintings. Their works were characterised by the use of a technique known as Divisionism or Pointillism. Divisionism, also sometimes known as Chromolumanarism, was a method of painting in which colour effects were achieved by applying small areas of dots of pure unmixed colours on the canvas so that an observer standing at an appropriate distance from the painting (suggested distance for best effect was three times the diagonal measurement of the work) the dots would appear to react together giving a greater luminosity and brilliance than if the same colours had been mixed together before putting them on the canvas. What these artists wanted to achieve was that the observer of the painting combines the colours, which are in the form of dots, optically instead of the artist pre-mixing them on a palette before putting them on the canvas. Pointillism comes from the term peinture au point, which was used by the French art critic Félix Fénéon, when he described today featured painting by Seurat. It can be defined specifically as the use of dots of paint and does not necessarily focus on the separation of colors. Divisionism refers mainly to the underlying theory, pointillism describes the actual painting technique associated with the likes of Seurat, Signac and to a lesser extent Pissarro. Pointillism is related to Divisionism which is a more technical variant of the method. Divisionism is concerned with color theory, whereas pointillism is more focused on the specific style of brushwork used to apply the paint. Enough is enough !!!! I don’t want to get too bogged down with “isms” and their meanings and I am sure that there are many people out there who can give a much more expansive explanation of the differences between Divisionism and Pointillism . My Daily Art Display today features what many believe is Georges-Pierre Seurat’s greatest work. It is entitled A Sunday Afternoon on the Island of La Grand Jatte. It was the one of the first painting to be executed entirely in the Pointillist technique and the first to include a great many people playing a major role. It caused a sensation when it was exhibited at the eighth and final Impressionist Exhibition in 1886. It is thought that it was possibly intended as a pendant to Seurat’s other work, Bathers at Asnière, which I will look at in a later blog. He started the work in 1884 and did not complete it until 1886. He spent two years making over sixty preparatory pencil and ink drawings, conté crayon studies and oil sketches on panel for this work. He would alter the grouping of people, the number of people within a group and where each group or individual were positioned until he was satisfied that he had achieved the perfect balance. There was a smaller version of the painting which can be found in the Metropolitan Museum of Art in New York. There is also a version of the scene without the people which was once in the private collection of Mrs John Hay Whitney. This painting we see today is massive in size measuring 207cms high by 308cms wide (almost 7ft tall and 10ft wide) and since 1924 has been housed in the Art Institute of Chicago. Seurat completed the final version of this painting in his small Paris studio. 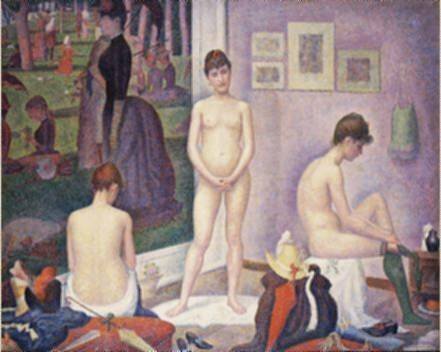 In 1888, Seurat also completed another painting which was entitled The Models using his pointillism technique, and which depicts models in his studio. Included in the painting is a section of La Grande Jatte and art historians believe that by doing this painting, he was showing the world that this technique of Pointillism worked just as well for indoor scenes as outdoor ones. The Île de la Grande Jatte is a small island in the River Seine, downriver from La Défense. It is about 2 kilometers long and just 200 metres wide at its widest point. At one time it was reduced to being an industrial site but now has public gardens and houses. Living on the island are approximately 4000 inhabitants. However in the days of Seurat it was a pastoral retreat where Parisians could come at weekends from their claustrophobic city existence and soak up the quiet and peace of this little idyll. Before us we see Seurat’s idealized version of the Grand Jatte omitting both the cafés and restaurants and the nearby ugly shipyard and factories. In the painting we see members of different social classes out for a stroll along the Grand Jatte by the side of the Seine. The figures, shown mainly in profile or frontal position, have a peculiar formal and artificial feel to them. As we look at the painting head-on, there seems to be a definite elongation of some of the people although I believe if you stand at a certain angle to the painting this is minimised. Seurat would sketch individual groups or single characters and then return to his studio to decide if and where each group should be placed on the canvas. He sketched people of different classes in society to give the idea that all types of people enjoyed promenading along La Grande Jatte. Look at the trio in the right foreground. Here we have the a man wearing a top hat and holding a cane who is more than likely from the upper classes of Paris society. The man with the muscular arms, lying back with a cap on his head, smoking the pipe is probably a working-class boatman and finally we have the young genteel lady of an indeterminate class. An unusual trio and who, although physically close in the painting, would be unlikely to have a closeness in that present-day society. The faces of the people in the painting show little personality. There is something very impersonal about them. We must presume that this was a deliberate ploy by Seurat who seemingly did not want the painting to be sullied by observers of the painting trying to interpret facial expressions. I don’t believe the artist ever intended this to be in any way a moralistic statement about the French culture and classes at the time. However, some would disagree. Art historians like to interpret every painting and seek symbolic depictions within a work so let us have a look at a few that have been thrown up for consideration with regards this work of art. In the left middle ground we see a lady dressed in gold and orange fishing in the river. I suppose there is nothing strange about that albeit she is hardly dressed as a woman who was to go out on a fishing expedition. Well consider what the French word is to fish – it is pêcher and some have suggested that Seurat has made a play on the word as the French word to sin is pécher. So is Seurat secretly identifying her as a prostitute. Again look at the woman in the right foreground accompanying the gentleman. Look what she is holding in her left hand – a monkey on a leash. That is certainly an unusual pet to take for a walk. So why did Seurat include a monkey. One possible reason is that a female monkey in French is une singesse. The symbolists would have us believe that a monkey is a symbol of licentiousness and that is why the French slang for prostitute is singesse. So again I ask the question is Seurat trying to tell us by symbolism that this woman is a prostitute who is out for a stroll with her client? It is interesting to note and it is not shown in my attached picture, that later Seurat painted the border using parallel red, orange and blue dashes and dots. He varied the combination of colours in different parts of this border in order to accentuate the adjacent colours in the painting itself. 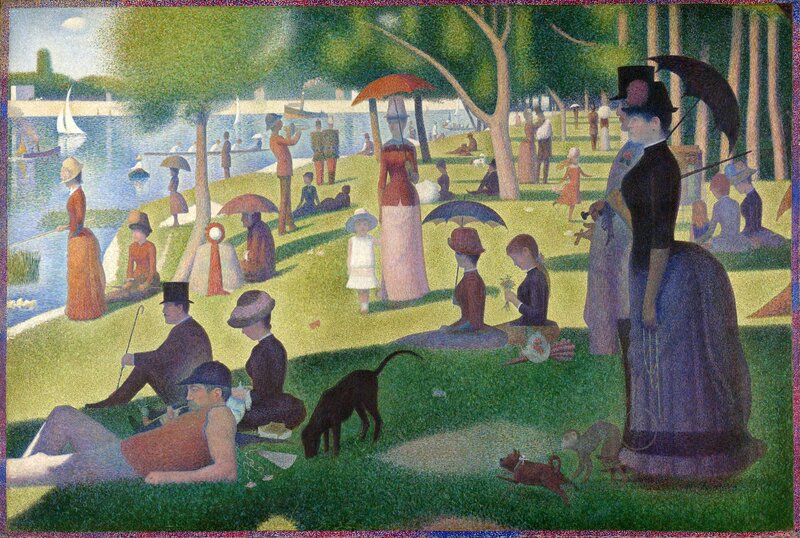 Maybe if you go to see the painting in Chicago you can let me know if Seurat’s idea with this border really works. 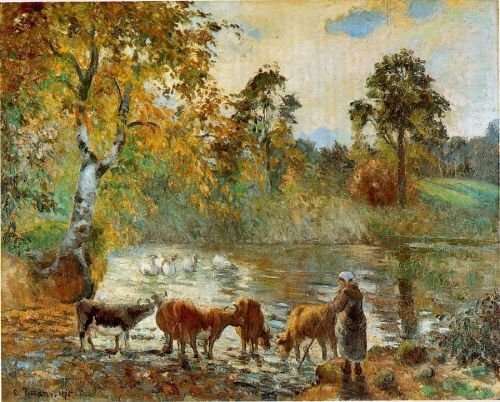 As promised yesterday my blog today carries on looking at the life of Camille Pissarro and one of his later paintings. So why did the majority of art critics hate the works on show? One should remember that the critics were brought up on the art of the Salon with its accepted works portraying religious, historical any mythological settings and so the paintings put forward by the Impressionists, including Pissarro, depicted commonplace street life and people busying themselves in their daily routine and was considered by the critics as both facile and some even went further by declaring them vulgar. The critics considered a lot of the Impressionist works as being “unfinished” in comparison to the works seen at the Salon. They commented that the way the brushstrokes of the Impressionists works were visible which, to their mind, meant it had been done in haste and often completed in a solitary sitting. In comparison they praised the Salon painters who to them were the “real” artists and who spent hour after hour carefully perfecting each part of their works. The year of this First Impressionist Exhibition in 1874 proved a bad year for Pissarro. His artworks were not selling and he had to endure a personal tragedy with his nine year old daughter Jeanne dying the week the exhibition opened. However, Pissarro stuck to his belief in the Impressionist movement and exhibited no fewer than twelve works in their second exhibition in 1876. Three years on the Impressionist grouping was starting to fall apart with Renoir, Sisley and Cézanne having left. There was also now a split amongst the remainder of the group with Degas on one side who wanted to bring in new artists and Caillebotte and Pissarro on the other who wanted to maintain the status quo. Degas also laid down the rule for the Impressionist group that any artist putting forward work to the Salon could not enter work in that year’s Impressionist exhibition. This was a major dilemma for some of the group who believed that to become a respected artist and command a good price for their works they had to exhibit at the Salon. The possible break-up of the Impressionists that had worried Pissarro showed itself in the sixth and seventh exhibitions with few of the initial contributors putting forward works for inclusion. Pissarro continued to support the Impressionist Exhibitions, refusing to enter works at the Salon and in fact contributed to all eight Impressionist Exhibitions. Times were still difficult for Pissarro and the collapse of the French economy at the start of the 1880’s made it even more difficult for him to sell his work. In 1884 he moved from Pontoise to the small village of Eragny sur Epte which lies north east of Paris. It was whilst living here that he met the artists Georges Seurat and Paul Signac and he became a convert to their new approach to art which was known as Neo-Impressionism. I will go more into Neo-Impressionism movement and the related “–isms” of pointillism and divisionism, both of which are relevant to Neo-Impressionism, when I feature the works of George Seurat. By the time of the eighth and last Impressionist Exhibition in 1886 there was an apparent lack of harmony among the remaining Impressionist artists, and the work of the Neo-Impressionists was shown separately from that of the others. It was noticeable that both Monet and Renoir were absent from this last exhibition. Seurat showed his now famous, and very large work entitled A Sunday on La Grande Jatte which he had just completed and which dominated the room. The room also contained Pissarro’s own Neo-Impressionist submissions which consisted of nine oil paintings, as well as gouaches, pastels, and etchings. Pissarro’s love affair with Neo-Impressionism was short lived and in 1889 he began to move away from the style, believing that it made it “impossible to be true to my sensations and consequently to render life and movement”. Impressionism at this point in time had run its course. Pissarro carried on painting city scenes although his erstwhile colleagues Renoir, Sisley and Monet had abandoned such subjects. Pissarro completed a number of works featuring the streets of Paris and the Gare Saint Lazare. In his latter years Pissarro suffered from a recurring eye infection that prevented him from his en plein air work and any outdoor scenes he wanted to paint he did so whilst sitting by windows of hotel rooms he stayed at, always making sure he had a top floor room with a good view. He carried on doing this when he toured around the northern French towns of Rouen, Dieppe and Le Havre and also when he made trips to London. Pissarro died in Paris in 1903, aged 73. He was buried along with the other greats of French art, music and literature in the Père Lachaise Cemetery. Camille’s descendents followed his path in the art world. His granddaughter, the daughter of his son Lucien, Orovida Pissarro is a painter in her own right. His great-grandson, Joachim Pissarro, is former Head Curator of Drawing and Painting at the Museum of Modern Art in New York and is now a professor in Hunter College’s Art Department. His great-granddaughter, Lélia, is an artist who lives in London. My daily Art Display featured work of art today by Camille Pissaro is a painting he completed in 1875 entitled The Pond at Montfoucault. In 1859, a few years after arriving in Paris, Pissarro, whilst attending the Académie Suisse, met some aspiring artists who would become very famous, such as Monet and Cézanne. He also became great friends with a lesser known painter, Ludovic Piette. Piette often exhibited at the Paris Salon in the 1860’s and also some of his paintings were shown at the Third Impressionist Exhibition of 1877. Piette’s home was in the small village of Montfoucault, which lies on the border between Normandy and Brittany. Pissarro went to stay with Piette on a number of occasions and when the Franco-Prussian war broke out Pissarro and his family left their home and took refuge with Piette before crossing the Channel to England. There is a beautiful tranquillity about this painting and one can see how an artist like Pissarro would have liked basing himself in this area.